If you are reading this webpage, there is a good chance that you were issued a speeding ticket along I-290 and your ticket is going to be heard in the Tonawanda Traffic Court. If so, you are not alone. According to a recent investigative study, the Town of Tonawanda has one of the top 10 speeding traps in New York State. It received almost 4,000 speeding tickets in the last calendar year. This makes the Tonawanda Town Court the number 6 slot of most ticketed speed traps. A first time offender that pleads guilty to driving in 86 mph in a 55 mph zone can result in a $693.00 fine and surcharge payable the court. It will also result in a $450.00 fine payable to the department of motor vehicles. This fee is known as the Driver’s Responsibility Assessment. Further, a conviction at this speed can result in a jail sentence and significant insurance increases. We have successfully fought thousands of tickets in New York State. We have helped our clients reduce their exposure to fines, penalties, and points on their licenses. If you have a speeding ticket or moving violation, give our award winning lawyers a call to schedule your confidential consultation. We can be reached at 800-893-9645. 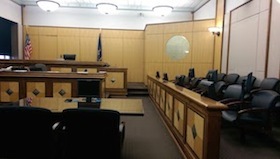 Tonawanda Town Court is located at 1835 Sheridan Drive in Buffalo, NY 14223. It can be reached via facsimile at (716) 876-0324. The town court is a court of limited jurisdiction. It can adjudicate civil, criminal, and traffic matters. Civil cases are limited up to $3,000.00 in controversy and criminal court is usually limited to misdemeanor matters. Traffic Court calendars are usually filled with cases written under the Vehicle Traffic Law. However, from time to time, tickets written under the Transportation Law and local law will be heard here too. Lawsuits for small claims and civil matters are accepted on Tuesday and Friday between 10:00 am and 12:00 noon. The Court has two elected judges. They share the judicial responsibilities. Each judge takes an oath of office prior to taking the bench and help administer justice in their judicial capacity. Our firm is led by Joseph P. Villanueva. He is a former New York City prosecutor with the unique ability to quickly analyze the strength and weakness of any traffic ticket. We have over 30 years of legal experience and have excelled at getting tickets either dismissed or reduced. Join the thousands of drivers that have saved time, money, and points on their license with our law firm. Give us a call today at 800-893-9645. How do I Retain You?